GAME-T is under an umbrella of Global Energy and Water Cycle Experiment (GEWEX) and GEWEX Asian Monsoon Experiment (GAME). The 6th International Study Confernce on GEWEX in Asia and GAME will be held at Kyoto, a famous historical city in Japan, from Dec. 3rd to 5th. Detailed information is available at the conference's Website. An research article on Kog-Ma Experiment Forest written by Dr. Hashimoto, Univ. of Tokyo, Japan was published. See English Publication Page for detail. A symposium was held by Japanese GAME-T(2) researchers on Dec 20, 2003 at Yokohama, Japan. Reports oand discussion on recent hydromet observation activities in Thailand. This Web (in Japanese) describes the summary and each speaker's presentation materials. It is necessary to read this. A seminar on Modeling will be held at Kasetsart University on 20th Aug.. Information and document are here. A session "Water and Energy Cycles in Asia Pacific Region" will be planned within APHW2004 in conjunction with the 1st AOGS annual meeting which will be held in the summer (July 5-8?9?) of 2004 at Singapore. Details will be shown here on this site. Convenors are Prof. Katumi Musiake (Fukushima University) and Prof. Nipon Tangthum (Kasetsart University). The first circular of the International Symposium on the Climate System of Asian Monsoon and its Iteraction with Society. Let's see here (PDF). The name has changed from Workshop to Symposium. The Symposium will be held at 11th-13th November 2003 in conjunction with GISP. As information, the past 2002 GAME-T Workshop in Chiang Rai was described here. Workshop recommendations of GAME-T Workshop in Chain Rai was finalized. Now you can download/view the finally accepted version of the recommendations at ChiangRai Workshop Document Archive. 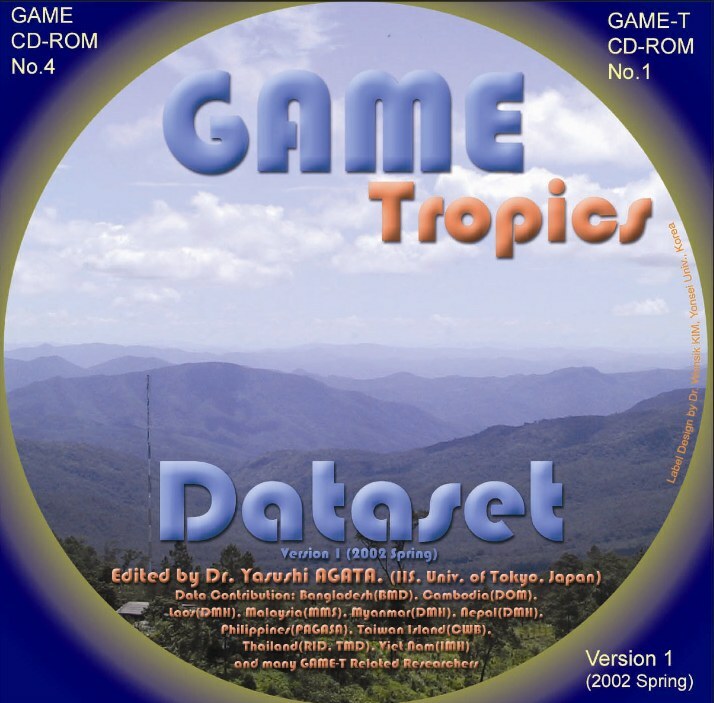 GAME-Tropics Data CD-ROM was published. This is the fourth Data CD-ROM published through GAME activities. Contact address : DB Manager (Japan) and NRCT foreign affair division (Thailand). The contents is the complete snapshot of this site at the beginning of this June, including all data files and maps. Visit related links page in GAME-T data center. Notice: These are WWW resources which introduce GAME-T related reserach activities. Web sites that show only datasets are not listed below. For such sites, visit GAME-T Datacenter and follow appropriate link, please. GPS Observation in Thailand by Dr. Nakaegawa, Meteorological Research Institute, Japan. Wind Profiler by Dr. Ohno, Communications Research Laboratory, Japan. SiB2 on WWW parameter manipuration and numerical experiment platform on WWW by, Kitsuregawa Labo, Univ. of Tokyo, Japan. KoFlux Korea Flux network (HQ: Yonsei Univ., Korea). Members are carrying out measurement mission at EGAT-Tower site since 2002. Home page of hydro labo, IIS, Univ. of Tokyo, Japan, where the GAME-T headquaters exists.